Where do we begin with the multi org structure in oracle apps? As they say, "Well begun is half done"! This is so true when implementing a multi org structure in oracle apps. 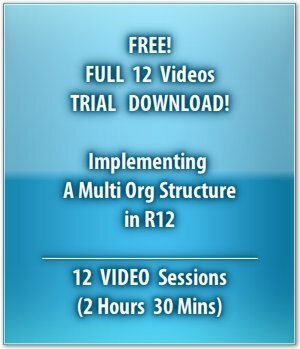 The 64 million dollar question is – "Where do we begin", when creating a multi org structure setup? Should we start with setting up the Legal Entities? Or, should we begin with the Set of Books, or Primary Ledgers as they are now called in R12? With a multi org setup, the place to begin is… the whiteboard! We need to have a clear picture of the multi org structure, and so a chart or drawing of the organization structure is the ideal starting point. 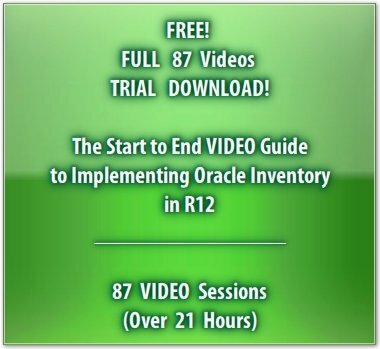 The Start to End Video Guide to Implementing Oracle Inventory in R12! Is there a Business Group? If yes, is there one or more of these, how many? How many countries does the enterprise structure cover? Typically, as many countries, so many government regulations and currencies. There will need to be that many Legal Entities and Primary Ledgers. How many operating units? Where do the Purchase Orders and Sales Orders originate, in the business process? There may be more than one such point, beneath each Legal Entity and Primary Ledger. Well, then we have that many operating units to construct. Inventory organizations or warehouses, subinventories and stock locators are the last building blocks, which can be accommodated with relative ease, once the other entities are put in place.Each operating unit would have one or more inventory organizations beneath it. An inventory organization is either a manufacturing facility or an independent warehouse. Therefore, inventory organizations need to have an address or location. Subinventories are storage areas within an inventory organization. For example, an inventory organization, which is a manufacturing facility may have a section on the shopfloor designated as raw materials, another section is designated as work in process (this area would typically store subassemblies), and an area called QA inspection. So, we have identified 3 subinventories within this inventory organization. We will deal with subinventories in a separate section. So, we have performed a top-down analysis that should help us draw our organization structure with the clarity that is required for a successful implementation. There are some entities in the creation of the multi org structure in oracle apps that do not depend on the existence of other entities. So, these entities do not have any dependencies. Inventory Locations are a typical example. It is the shipping or the mailing address associated to an organization. Legal Entities and Inventory Organizations need to have locations assigned to them. Once we have the Organization Structure drawn out on a whiteboard before us, we come to know how many Inventory organizations are involved. We can begin, by defining a Location for each of these. The address for Legal Entities is created, when defining the Legal Entity, in the Accounting Setup Manager. 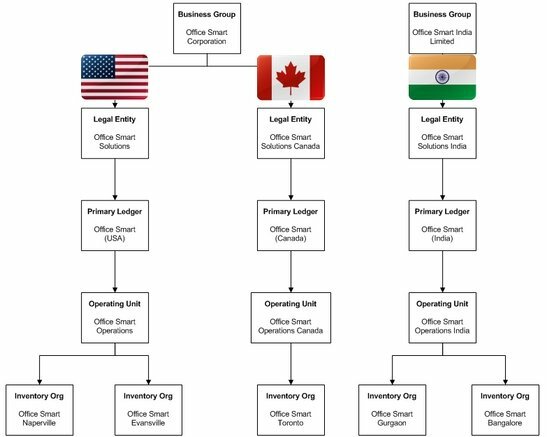 Office Smart has 5 inventory organizations in its multi org setup. These inventory organizations are located across 3 countries. We begin our multi org structure in oracle apps by defining the locations for these organizations.